U.S. Billionaire Bonanza 2017: Three Men Now Own More Wealth Than the Bottom Half of the Country Combined | "Global Possibilities"
Jeff Bezos, Bill Gates, and Warren Buffet are the super rich guys. Anyone tracking the growing concentration of wealth can tell you the rich are getting richer. It’s not so easy to tell you exactly how rich. Enter Billionaire Bonanza 2017: The Forbes 400 and the Rest of Us. This report updates a report we published in 2015 that compared the billionaires showcased in the glossy pages of the annual Forbes 400 list to the rest of the country’s financial condition, captured in the triennial Survey of Consumer Finances by the Federal Reserve. The data from these two sources became available less than a month before we published this report and has been updated to uniform 2017 dollars. One of the big findings from this year’s study is that just three people—Jeff Bezos, Bill Gates, and Warren Buffet—own more wealth than the bottom half of the country combined. In the first edition of Billionaire Bonanza, published in December 2015, our big fact was that twenty people –enough than could fit on a Gulfstream 650 luxury jet, had as much wealth Just two as the bottom half of the country. Now they could fit in the cockpit. The concentration of wealth at the tippity top of the economic spectrum is extreme. The Forbes 400 together own $2.68 trillion in wealth, more than the GDP of Britain, the world’s fifth richest country. They also own more wealth than the bottom 64 percent of the country combined. On the other end of the spectrum is Underwater Nation, the portion of the country with zero or negative wealth. About one in five Americans live in Underwater Nation, a proportion that grows higher for Black families (30 percent) and for Latinos (27 percent). Of course, understanding the growing economic divide is of limited value on its own. As public scholars, our mission is to inspire change. We offer a host of solutions that would get the nation off the path we’re on and towards one of greater equality and fairness. This report comes as Congress considers passing the Trump tax cuts, a plan that would surely increase the wealth divide. It also comes in the wake of the Paradise Papers, a sensational story showcasing the pervasive impact of offshore tax shelters on the country’s wealthiest households and corporations. We know for sure that the numbers we publish in our report understate the wealth of those at the top since money hiding in tax shelters is, by its nature, hidden. 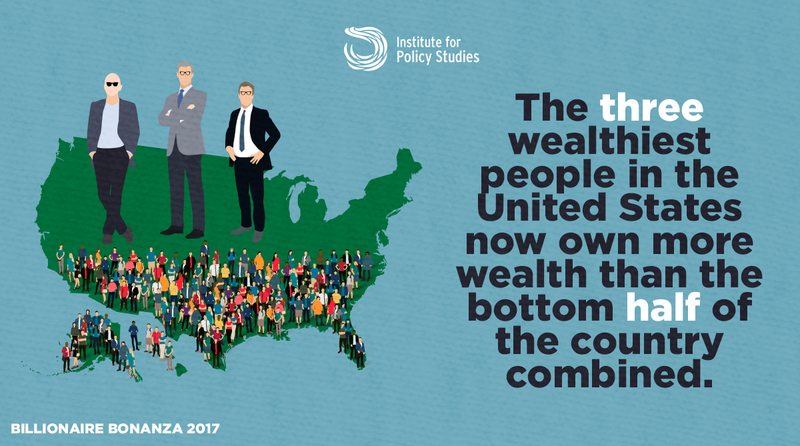 We’re hopeful that this report can serve to provide a deeper understanding of wealth inequality in the United States today and inspire activists, academics, lawmakers, and citizens to work for change. Chuck Collins is a senior scholar at the Institute for Policy Studies and coeditor of Inequality.org. His new book is Born on Third Base: A One Percenter Makes the Case for Tackling Inequality, Bringing Wealth Home, and Committing to the Common Good (Chelsea Green, Fall 2016). Josh Hoxie is co-editor of the Institute for Policy Studies web site Inequality.org and related weekly inequality newsletter.